The groups I've performed in over the years. Check Feedback for more detailed information. Note: I have started recording my own original work and posting them to Facebook and YouTube. This satisfies my need not to play or record 'covers'. While not a band activity, I have included it in the Timeline. 2017 The Yallourn Madrigal Singers Rehearsing for our next concert. The Deep Blue Playing the PICAL Evening Markets at Cowes and getting positive comments from patrons and vendors alike. Brisbane Steel Club Playing bass as usual, but, am also playing a set at the main concert on slide. Solo Still doing the odd gig here and there, mainly supporting Morwell Lions. The Lions suprised me this year by presenting me with a service medal at the Australia Day Breakfast that they host. Nice to be recognised. Spending most of my time recording original songs and placing them on Facebook, YouTube and SoundCloud. 2016 General Note: Had to again re-evaluate my commitment to the many groups I perform with. Most have been retired or rested. Still doing gigs. Moved from playing keyboard to playing guitar and then both. Even brought the slide along one gig. The band folded in June as a result of Paul Duff making demands on the other members, not having them met, spiting the dummy and leaving. We have resurfaced as a Trio: Me, Martin and Paul. BOTSO The creators of the group have left for various reasons leaving the group to manage itself. Time to move on as well. Rehearsal Group 1 Unfortunately I had to resign as my right arm was giving me hell to the point that I couln't play the double bass without cramping. Rehearsal Group 2 Gone as well, just too hard, the fun wasn't there. The 'exactly' part was just too demanding. Baw Baw Blues Club Hiatus. Solo Getting back into performing solo and winning quite a few gigs here and there. Spending most of my time recording original songs and placing them on YouTube and SoundCloud. Brisbane Steel Club Playing bass in the house band again. Decided that I needed to step up and do some proper singing. My friend Martin Carruthers had been at me for years to join, so I finally decided that I should. Martin and I were part of a four part, Barber Shop style group named Reunion in the 80's. The Yallourn Madrigal Singers are a Soprano/Alto/Tenor/Bass (SATB) choir and they are certainly into dotting the I's and crossing the T's which is a good thing. We not only sing in English, but Latin, French and German. After working through the probationary period, I was accepted as a member of the choir. Good to be singing some serious music. Playing keyboard and singing in a four piece band located on Philip Island. We are currently playing at the PICAL Market in Cowes and have a strong Stevie Ray Vaughn sound. It's not really a band in the true sense of the word, it's really Paul Duff and his support band. Paul just takes off and the rest of us hang on and do the best we can. Interesting times. BOTSO Going well. Still playing slide guitar. Rehearsal Group 1 Still very relaxing. Rehearsal Group 2 Interesting project with a group of people wanting to record original music. Their guitarist moved on and I was 'headhunted' to replace him. Fair bit of work to 'tool up' as I have to play his parts exactly. Five piece band: Vocalist, Drummer, Bass, Saxophonist, Keyboardist and Guitar. Baw Baw Blues Club Supporting the locals. Gippsland Rhythm and Blues Club Drifted back. Solo Still doing gigs here and there. Brisbane Steel Club Playing bass in the backing band for their annual festival. Second year. 2014 General Note Due to a change in circumstances, I have had to re-evaluate my musical adventures, and so some have been retired, or rested. Play bass in a group of five people just for the fun of it. We rehearse most Monday nights and it's a most enjoyable experience. Traralgon Eisteddfod Booked again this year. Looking forward to it. Unfortunately through lack of entrants and patrons, the event has been retired to the dismay of many. Sixth and final time. Brisbane Steel Club Asked if I'd like to play bass in the backing band at their annual steel festival. Of course I accepted. BOTSO Onward and upward. There has been a change of leadership, so it will be interesting to see what happens. There's really only room for one bass player in any group. Another player has expressed interest in the position, so I am moving on to slide guitar. Buskers Club Retired from this group, Shame, as it was going places. Jambusters 'Graduated' from this group. Elwood Blues Club Giving the club a rest for awhile. Baw Baw Blues Club Support the locals that support you. Country Club. Have decided it's time to move on from the 'Our Kinda Country Club'. Time for new blood. 2013 Traralgon Eisteddfod My fifth year, my doesn't time fly. I'm really enjoying this year and the comradre built up over the years has made attending this event a pleasure. It's no longer work, we have a lot of fun. Buskers Club Karl Mohr's backing group. Karl invited me to play guitar, sing and run the P.A. This is the first band I've have joined in twenty years and it's looking good. There's a simplicity on the line up. No drums or backing tracks, just honest good playing at a most reasonable volume. Karl Mohr: Singer- Songwriter, band manager. Katie Hearne: Vocals and guitar. Terry Cupples: Bass and vocals. Me: Guitar, vocals, P.A. engineer. BOTSO Settled on playing Double Bass. Jambusters Moved to playing Mandolin. I've now moved further on to Double Bass. Solo Still winning gigs here and there. Baw Baw Blues Club New club based at Darnum, specifically at the Pub. Although it clashes somewhat with the Elwood Blues Club, I try and spend the first few hours there and play guitar and double bass. I'm prepared to support them. They don't mind if I play consecutive sets. The best thing about the club is that there are lots and lots of very good players, and, a feature act. After that you can join in on the jamming. Gippsland Rhythm and Blues Club I have tried and tried to make this work, but, it has become too negative and aggressive for me to support. I try and support whatever I can and attend, as that is what makes a club survive: Patronage. The club runs on the last Sunday of the month and hence is a clash with the Elwood Blues Club (EBC). However, I can play in the first hour and head off to to the EBC. I have played two consecutive sets before. The 'Straw that broke the camels back' occurred one Sunday. I only had an hour so I asked Peter (Pedro) Gray if I could play two consecutive sets and would head off for the EBC. Pete replied in the affirmative and I played the first set on keyboard. I stayed on stage as I planned to play one more set and then set off. However, a committee member came up to me and told me to get off as I had played three songs. I told him about my conversation with Peter, but that wasn't good enough he told me. Peter's not a committee member, I AM, so F@#K OFF! I returned to compliment and packed up resolved to never return until he was off the committee. I most likely won't be missed, but, I don't need to be subjected to that sort of behaviour. Country Club Still mixing the P.A. and playing Guitar/Double Bass for the 'Our Kinda Country Club'. Bluegrass Festivals and Conventions I've given them up. I originally started attending these events to learn to play Dobro. I have learnt enough to play a Dobro and have no interest at all in wanting to play Bluegrass Dobro. I am finding it difficult to play anything as I'm not a Blueegrass player. When I try something close, the Bluegrass Police make it most unconfortable to me, as it usually involves a degree of public shaming. Well, not any more! My project is over and so are the Festivals and Conventions, they are welcome to them. I have made quite a lot of festival friends and will really miss catching up with them. I may just drop in unannounced from time to time. 2012 Fill-In Guitarist Various bands when in trouble give me a call to fill in. Filled in on guitar with Bill Rowley and bass with Karl Mohr. BOTSO Brunswick Old Time String Orchestra. Organised by Brian Strating and Andy Baylor. Big group, twenty or more when available. I was recommended to check out this group after a chance conversation with a muso I meet at the Beechworth Kelly Country Pick. I'm playing Cello in an Double Bass sort of way. Enjoying the experience immensely. They rehearse at the Princes Hill Bowling Club which requires a bit of traveling. We've played two charity gigs which went over very well. Traralgon Eisteddfod My fourth year being the 'House Band' for the Country Music section of the Traralgon Eisteddfod. John Paul Experimental duo with Paul Morris. We are both playing an instrument that is new to us, so there's lot's to learn. I'm playing cello and Paul is playing percussion. YouTube Composed, recorded some new material and uploaded them to YouTube. Solo Still winning gigs here and there. Port Albert, Carino's, Drunken Poet and charity gigs. Jambusters Moved to playing bass lines on a cello. Country Club Still mixing the P.A. and playing bass for the 'Our Kinda Country Club'. 2011 Jambusters Playing Dobro in a beginners group optimistically named Jambusters. Another big group of twenty plus players. Jambusters is an effort by the Strzelecki Stringbusters to give beginners experience. Mainly Bluegrass instruments: Guitar, Mandolin, Banjo, Fiddle, Double Bass with the occasional Ukulele and Dulcimer. Rehearsal Band A new concept where you just rehearse with fellow muso's with no gig at the end. I've always enjoyed the rehearsal process. Traralgon Eisteddfod For the third consecutive year, I was the 'House Band' for the Country Music section of the Traralgon Eisteddfod. Recording Engineer Recorded, produced mixed and played all the instruments for Bob Coopers second CD. Bob won the amateur section at TSA this year based on last years recording effort. Solo Port Albert rolls on, fantastic. Recording Engineer Recorded, produced, mixed and played all the instruments on a CD for local Country artist Bob Cooper. Solo Still winning solo gigs and that's a good thing. The Port Albert Pub has been a good patron for most of the year on a regular basis. Country Club I have been 'promoted' in the club and now mix the P.A. and play bass each club night. A full time, full on job. The Badgers A fill in role with local group 'The Badgers'. Their keyboard player as taken a shift job and is unavailable every second weekend. When the band wins a gig and he's away, I fill in for him. 90% of the time I am playing keyboard with the rest on guitar and that has proved to be interesting for me and useful for the band. For the second consecutive year, I was the 'House Band' for the Country Music section of the Traralgon Eisteddfod. I was utilised more by the various teachers and performers than last year. This year 'backing tracks' were banned and I sure it was a good move, as it was more a performance of the performer. The Country Club has proven to be quite a resilient organisation and am still enjoying my involvement with them. We get to travel a bit and that's good. Traralgon Eisteddfod The big event for the year was being the 'House Band' for the Country Music section of the Traralgon Eisteddfod. Never done it before, but I must have passed the test as I've been asked back next year. Just A Jam Had another interesting experience where I attended a jam held in Newborough during the middle of the month. The organisers put together enough people to perform. No one wanted to sing, so I accepted the position of vocalist and suggested 'Route 66'. Twelve bar, how can you go wrong? Easy! I tell the bass player it's twelve-bar in 'A to which he nods in what I thought was an understanding of what I had just told him. Not so! he plays 'A' all the time! I had to turn around as I was singing and yell out the next note for him to play. Forget about any fancy scales, notes!. To top it off I was playing through a poor 60 watt Marshall that was about to have a hernia, until I managed to signal to everyone else to just play a little quieter and then the quality improved. And I thought I was going to have a pleasant afternoon. There was one good moment when I played bass for Carl Radford while he played 'Albatross'. Earlier we had been chatting at a table about Peter Green. Carl just walks up and asked to play bass for him. Carl loaned me his Les Paul guitar to play in the above mentioned jam as I hadn't brought an instrument with me. Boolarra Folk Festival It was damp and my electronic gear just wouldn't have a bar of it. Maybe next year? Well it's back to basics for me! It's not quite as it seems though. I have invested my time lately in playing in 'House Bands' at Blackboard Concerts! However, playing for a maximum of three songs just leaves me cold, literally. You would just have thawed out before you'd have to finish. This appears to me to be a form of some sort of acceptance of a punishment syndrome where the harder things are, the better you like it. Sorry, that's just not me. Instead, I just tuck myself behind the performers and try and support them as best I can. It's not just guitar either, I enjoy playing Bass as well and on even rarer occasions I'll take the slide guitar along. I had done this for the Latrobe Valley Rhythm and Blues Club, which have a Blackboard concert once a month. I became rather tired of all the guitar heroes there. It appeared to be more of a confrontation than a sharing experience. To cope, I have switched to just playing Bass there. Much more enjoyable. Given the usual statistics that there will be 15:1 ratio of guitarists to Bass players, I could be somewhat in demand. The reality is that there's some sort of unwritten rule that states: The louder you play and the less you listen to the other players the better the performance! What the ? I have some residual hearing left and I aim to keep what's left safe for my old age. Given this situation and the fact that no one seems to be musically literate, the effort just seems to be a waste of time. No amount of effort will motivate the other performers into playing something more musically interesting. It just seems to be the same old songs month after month, year after year. To cap things off, being in a jam, you can't choose your accomplices. The result being that the lowest skilled musician drags the rest of the group down! Why, Oh why, would you want to be part of that? Busked at the Boolarra Folk Festival, the only busking job for the whole year. Outback Club Played in the Outback Club which was based at the Rossmore Hotel in Yallourn North and organised by Karl Mohr and Garry Gunn. For various reasons the gig fell apart after a few months. It was fun while it lasted. The emphasis was more on playing Pub music than Club music and hence, a lot louder. It's a pity it folded when it did. This line up has proved to be more permanent than I originally thought. We are getting out and about and that is a good thing. Brian started performing before me in the early 1960's and informs me that he had a stint with 'The Cherokees'. Brian sings and performs on either guitar or keyboard. Ron is a relative new comer to the music scene who sings and plays guitar in a 'Slim Dusty' sort of style. France sings, yodels and plays guitar in a Country sort of way. Bob sings and plays guitar. Bob composes quite a lot of songs based on his experiences in a Bush Poetry sort of way and had a win with one of his songs at the Traralgon Eisteddfod. Brian and I end up playing most of the night as when are not performing, we are backing up other performers. Yarragon Pub has become somewhat of an enigma. I doubt if I'll be playing there anytime soon. I stopped by in October and witnessed Peter Calabro and Liz ? performing and was approached by Barry (the owner) who stated "I have a few vacancies in January" and before even finishing the sentence ran back into the pub and never quite finishing what he started. Clearly I was targeted as a provider of music but was not of a sufficiently high standard to have him give me his full attention. I still doubt I'll be here anytime soon. I've done quite a bit of travelling lately, and that has proved worthwhile and rewarding. Sunbury, Johnsonville, Leongatha , Upwey, Heyfield, Yarram and more. Played at the Red Parrot at Noojee a few times and have enjoyed the experience. The owner, Brian loves his music and that's the way I like it: An owner who loves his music. In an email to me, and others no doubt, the LV R&B Club claim that there have been complaints about the excessive sound level and have taken the extreme, if not unusual step, of using a sound level meter to monitor the level of acts. Not too sure what the penalty is if you go over whatever the limit is. Maybe it's early days, but, the event still seems very loud. The outside seats would have more people seated at them than do the internal seats. Some sort of propaganda? Maybe? If your an adult you can make your own choice. But when parents bring young babies and children along with them, you really have to wonder what hearing damage is being done. The single greatest attribute you need as a supporting player is the ability to listen. Your job is to support someone else. This can be quite tricky at times as the performer may not have charts to read from. If they don't have charts, then you listen really hard for where they are going, as at times even they don't know where they are going. Timing is the killer here, as performers with not much live experience have a very difficult time of keeping to meter. Yes, they know that the next bar has some words in it and some chords too. Somehow what was intended to be a 4/4 bar ends up being 5/4, 6/4, anything. Another issue is the tuning of their instruments. It's quite amazing how a performer will leap into a song with their instrument not tuned to standard tuning and even worse, some strings not in tune with the others! How they can not hear this is beyond me. Most performers make an attempt, but some quite clearly do not hear they are out of tune. Terrifying! I once backed a performer who had two guitars. When the first guitar went out of tune they just reached for the second guitar. I had been using a Roland SD-35 MIDI Player to play my backing music, but increasingly it became a victim of of obsolescence. The device uses 3.5", 720K floppy discs. Just try and buy them now, no hope. The HD variety would just not format. So I moved on and purchased a laptop and that worked very well. Last year the laptop expired and I was faced with replacing it. Just prior to the laptop's demise, I had spent a lot of research and development time trying to achieve the same results on a Pocket PC. Fortunately for me, I succeeded and that's what I use now. The only down side is that I can't play MIDI files but have to play MP3 versions of sampled MIDI files. This complicates the creation of new files, but I know how to do it now. I really have to say at this point that Bill Gates has lost it! The new Microsoft operating system Vista is junk! It's performance and level of paranoia have to be experienced to believe how bad it is relative to XP, the previous version. Must be a death wish or something on Bill's part. No wonder he's left Microsoft! It's happened again! Just as I have mastered the PDA environment, I find that the people who make these devices (read HP, etc) have abandoned the platform in favour of the even more ubiquitous Mobile Phone. It's all right, I've taken ten deep breaths and I can feel the Chi flowing through me, however I feel even more despondent and pessimistic of ever finding a stable platform. Seems like the only cure is to throw away everything that you have invested in and buy new hardware ... again! Long live retail! Fairly quiet year and didn't go out to try and win gigs or anything. Performed at a few private functions and the odd public function by people who tracked me down. Busked at the Boolarra Folk Festival. Nice to have the food vendors and others, make the effort to walk across to me and thank me for my effort. The new improved Concrete Pumpkins. From left to right: Fiona Watts, David Graham, Hans Visser and me. This was taken one Saturday afternoon at Dave's place, rehearsing for the Mt Baw Baw Music Festival. The music has become much more complicated from Classical to Bluegrass and most other styles in between. We spent quite a few months rehearsing three times a week, which required a lot of travelling. After performing at the festival I decided it was all too hard, youth is more aggressive than the burnt out elder,and, that the band didn't really fit me all that well. An experiment at best. 2006 Solo Performer Yarragon Pub and Lea Low Caravan Park. Hans and I decided to get together and play some fun acoustic music. I sing and play acoustic lap steel and Hans sings and plays banjo, mandolin and metal resonator guitar. 2005 Solo Performer Moe RSL, Yarragon Pub, Moe Racecourse, Johnsonville Caravan Park. KGB/Flashback Back into a band again. This time with Karl Loehr on Bass, Garry Downs on Drums and me on guitar. Well Busking is off the menu nowadays. It's a complicated decision, but I've made it. Finding places that don't fear you. A public that has a few coins to throw you. I hadn't realised it at the time, but busking anywhere near retail stores brings forward the most negative of feelings towards you. Basically, you are a parasite and you are robbing them of an income. The retailers don't take these feelings lightly, they will become most active in trying to 'move on' this vagabond who has set up amongst the legitimate traders. A few so called friendly festivals have also fallen into the Corporate model trap and treat Busker's like lepers. Played at the Buchan Foothills Festival, Noojee Country Music Festival, Moe RSL. Played at Buchan Foothills Festival, Bruthen Blues Festival, Tamworth, Catchadelli, Moe RSL, Morwell Club, Merton Rush, Ryans Hotel, Cowarr Football Club, Sunbury Football Club, Kings Canyon Resort, Musicians Club Broken Hill, Sage Technology functions and various weddings and birthdays. Played at Loy Yang Power end of year function,Tamworth, Amigo Restaurant, Moe RSL and Merton Rush not to mention birhday parties here and there. 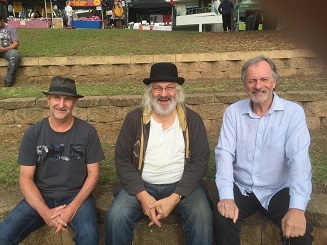 Busked at the Buchan Foothills Festival, Mortlake Buskers Festival, Goulburn Blues Festival, National Folk Festival, Bombala Motorcycle Show and the Bruthen Blues Bash. Released CD 'Now and Then'. I had released these tracks on an LP that I had passed around to friends and it never really had a public release. I thought it deserved that. Supported Geoff Achison at the Yak, Abbotsford. Informal set at the Yak with Alex Burns. Busked at the National Folk Festival in Canberra, Bruthen Blues Festival, Maldon Folk Festival, Port Fairy Folk Festival,Queenscilff Festival, Buchan Festival, Boating Fishing Camping and Great Outdoors Expo at Morwell and most Sundays in the first nine months of the year at Yarragon. Released CD 'Lonely Hearts'. Performances at the International Food Fair at Traralgon and other places to support the CD. Released CD '11 Bar Blues'. 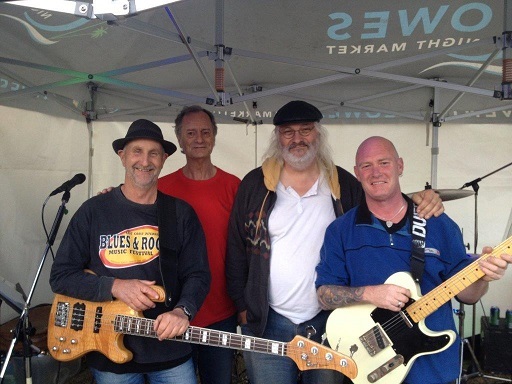 Performed at Moe RSL, Morwell RSL, Morwell Club, Traralgon Bowling Club, Churchill Pub, Royal Exchange Hotel (Flannagans), Woodside Pub, Wild Lime Café, Bruthen Blues Festival, Tyers Art Festival and Latrobe Valley Rocker functions. Performed at wedding ceremonies, wedding receptions, business functions and Sunday Markets throughout Gippsland. Busking at Collins Place, Port Fairy Folk Festival, Walhalla and Yarragon. I have developed an acoustic set performing blues, bluegrass, original, and popular tunes using resophonic guitars and no PA, ideal for those very quiet functions. Performing at small to medium sized functions, offering a large choice of all types of musical styles. Performing regularly at the Amigo Restaurant, Traralgon and the Moe RSL on Friday nights. Performed at '29 Grey St', Traralgon as the resident Friday night act from July 1993 to December 1996. Performed at wedding ceremonies, wedding receptions and business functions throughout Gippsland including the end of year break up at IBM Global Services Australia in Melbourne. Busked at the Port Fairy Folk Festival, School fundraising activities, Sunday Markets, Art Shows, etc. Restaurant duo, holding a residency at DaNunzio's restaurant, Moe on Saturday nights. We play all styles of music with careful attention to keeping our performance volume low, so as to not interfere with the restaurant patrons conversations. Mind you, when they wanted to dance, we could do that too. Being a duo we also harmonised. After Pyramid folded I made the decision to not involve myself with another band. This was not because I didn't enjoy the fun, music and comradre of the other members, but rather a sort of self preservation move. After playing at a high volume level for all these years, my ears just coudn't take any more abuse. Hence my future involvement with music would be quiet affairs in order to not increase the volume of the tinitus taking over my ears. I had tried mechanical devices like ear plugs, etc, but that removed me from the music. In a sense the choice was already made for me. Cabaret/Function band that performed all through Gippsland. This was the main act for the period. Residency over Christmas/Easter holiday period at the Scallop Pot restaurant, Lakes Entrance. Backed up national performers at various venues. Support act for national and international acts. Supported local acts like Melinda Johnstone and Ron Perry. Keith Ingleton, Steve Godwin, Garry Downs, Neil Hicks. An experimental trio that performed for about 12 months. A 'Looking for direction' move for me. Peter had been out of the band scene for awhile and wanted a bit of a refresher and Patricia wanted to sing in a harmony band. We met the goals. Performed for fun and friendship. Part A Cappella quartet, singing old time and gospel songs that performed for about 12 months. Leant a lot of self control in this group. Wrote/Recorded an LP with a limited release. This became 'Now and Then' in the CD world. Cabaret band with a country feel. Performed at wedding receptions and balls in the Latrobe Valley area. 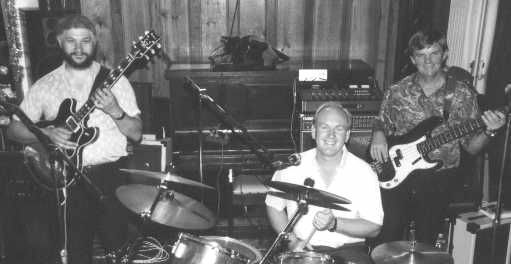 Pub band that had a residency every Wednesday at the Hotel Motel in Morwell and Thursdays at the Royal Exchange Hotel in Traralgon. New players same gig! This was a real POWER trio. Peter was an awesome player and Colin was a much more technical version of Keith Moon but with the same intensity. These were good times as we had the Stoned I residency, kept the patrons happy and just had a good time. NO POLITICS!. We were together for nearly two years and they were two very good years. Peter came up with the bass line for 'Mr Clapton' which appears on the CD '11 Bar Blues'. The song 'Long Time' is memoriam to Colin Auld. Pub band that had a residency every Wednesday at the Hotel Motel in Morwell and Thursdays at the Royal Exchange Hotel in Traralgon. I was originally recruited to take the place of Ray Orr who was moving interstate. I ended up playing a few months with Ray before he left and that was good. Hard to believe that the gig only lasted two hours. 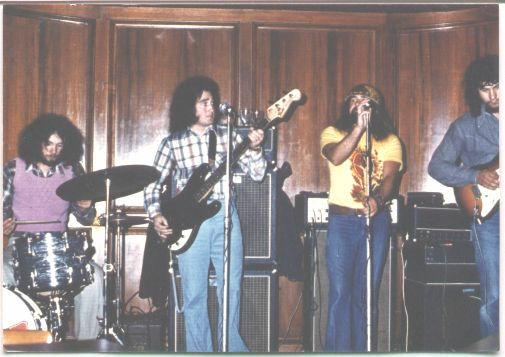 From left to right: Kevin Pocknee, Tony Marino, John Revellje and John Mazur. Fun group performing R & B. We were all between bands and decided to have a bit of fun. Achieved 4th in the Battle of the Sounds at both Moe and Warragul. 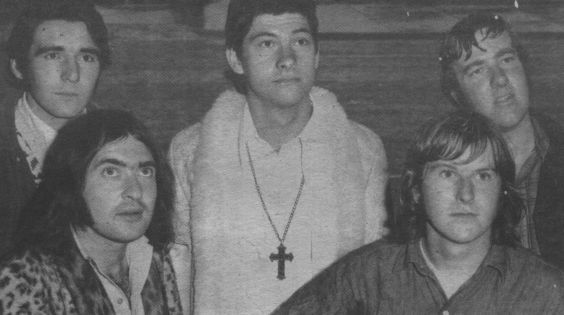 Left to right: Sandy Clark, Umm, Duncan and John Mazur. at the Moe Battle of the Sounds. Filled in on lead guitar for about 10 months. Ken McTaggert (or is it Mactaggert or even Mctaggert?). Filled in on lead guitar for 1 month. Cabaret/Function/Dance band that performed all through Gippsland. Quite a powerful band as we had three lead vocalists and Lloyd really pushed us hard to learn new songs. Won the 1971 Battle of the Sounds representing Gippsland at the state finals at Festival Hall in Melbourne. Backed up national performers at various venues like the Paynesville Hotel. Support act for national and international acts at places like The Kasbah Club in Morwell, Papa Joes in Sale and the Longwarry dance. Released a single: Maxwells Silver Hammer/Flying with the help of Alan Morgan. Lloyd wrote Flying. Lloyd modified his Leslie to include a light show. He fitted two different coloured lights into the cavity that held the tweeter horns. Every time he changed speed, the lights changed colour. Looked good even if it was a pain to cart around the gigs. 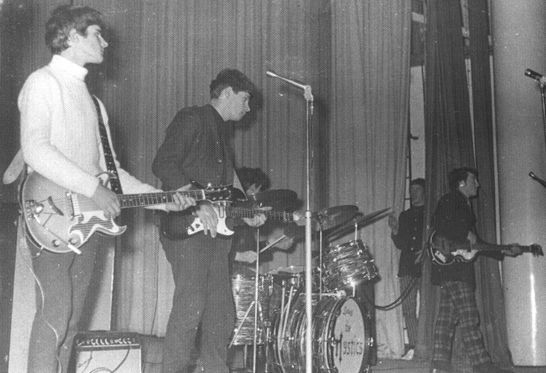 From left to right: Lloyd Poole, John Mazur, Keith Ingleton and Mick Cook. Pop band the played the dance halls throughout Gippsland. The band only existed for three months but built up a good following in the time that it performed. Sandy and I had a lot of fun playing lead guitar often with playing a harmony line. The band folded because Arthur left the area. Left to right: Colin Atkinson, Arthur Wheatley, John Mazur, Greg Trevorrow and Alan Langmaid. 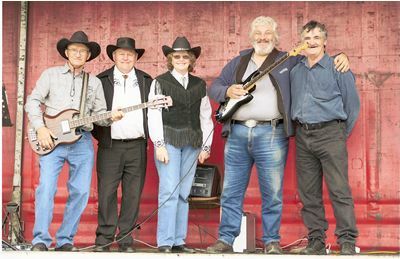 Pop band with a hint of R&B that played the dance halls throughout Gippsland. I was recruited as a fill in for Tony White who was ill on Christmas Eve 1966. Tony decided to leave Morwell after completing High School and I was offered the job. Great move for me! The band was a great source of inspiration. Progressive band that played contemporary songs as well as blues and soul. The band achieved great popularity and had a reputation for performing popular and alternative material. Through Colin's influence we played Soul and Blues. Now that was different for the time. Supported and backed up many of the top acts of the day. From left to right: Graham Dean, John Mazur, Kevin Pocknee and Tony Marino. Lost in the mists of time. I was talking with Greg Trevorrow recently and he reminded me that I performed in this band although I have no memory of it. Must have still been at Morwell High School.